Sauté onion and zucchini. Combine soup, sour cream, cheese, and carrots. 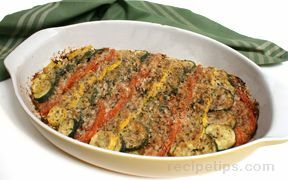 Fold in zucchini and onions. 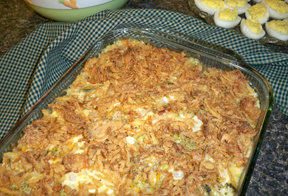 Combine stuffing mix with 1/2 cup butter, spread 1/2 into 9 X 13 pan. Spoon vegetable mix on next and then top with other half of stuffing mix. Bake at 350° for 20-25 minutes. 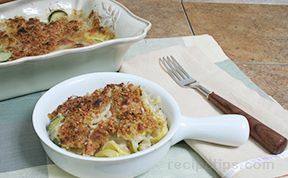 *Can add baked, chopped chicken for a main dish alternative.